Ertiga is available in 6 different colors - Superior White, Silky Silver, Granite Grey, Serene Blue, Pearl Blue Blaze and Radient Beige. Watch latest video reviews of Maruti Ertiga to know about its interiors, exteriors, performance, mileage and more. The first generation Maruti Ertiga tasted huge success, thanks to its sheer practicality, fuel efficient engines and a compact silhouette that could seated 7 passengers. The pricing too was quite attractive and competitive. Since its six years of existence, Ertiga has managed to create a success story of its own, making it one of the popular MPVs among others. 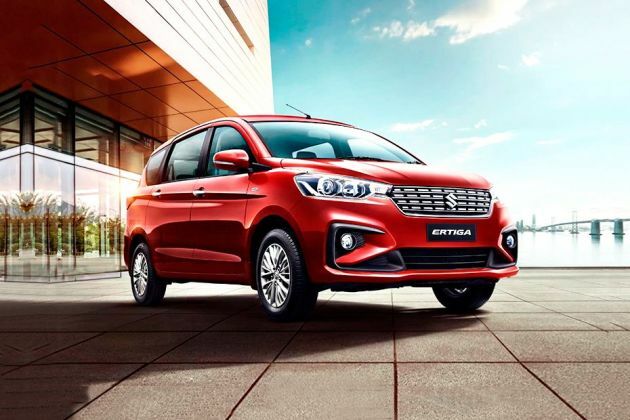 So, to continue with the same spree, Maruti Suzuki introduced the second-gen model of Ertiga with the competitive pricing, more comfort features and fresh set of engine options. The new Ertiga comes with the all-new design along with an all-new Heartect platform. Just by looking at the new MPV one can say that it’s a better car as compared to its older model. The second-gen Ertiga do offers extra to the buyers with new design and advanced features while retaining its value proposition by competitive pricing. On the outside, second gen Maruti Suzuki Ertiga is crafted on the Heartect platform which also underpins Baleno and Swift as well. The MPV is about 20kg lighter despite being much bigger as compared to its older version. The car looks way much stylish and premium and offers and eye-catchy appeal. On the front, car features chrome laden radiator grille, swept back projector headlamps and fog lamps with boomerang shaped element around it lending the front an attractive appeal. On the sides, the car gets floating roofline and thick shoulder line runs across through the tail lamps. The new Maruti Ertiga continues to ride on the 15-inch multi-spoke alloy wheels. Dimensionally, new Maruti Suzuki Ertiga measures 4395mm in length, 1735mm in width, 1690mm high and gets the wheelbase of 2740mm. That means new Ertiga has grown by 99mm in length, 40mm in width and 5mm in height. Maruti Suzuki Ertiga is available in five shades namely Metallic Magma Grey, Pearl Metallic Auburn Red, Pearl Metallic Oxford Blue, Metallic Silky silver and Pearl Arctic White. New Ertiga is longer and wider, that means it offers more space on the inside. The dual tone coloured interiors with wood inserts do give the sense of premiumness. The layered dashboard design looks quite contemporary. The car features the same flat-bottomed steering wheel and instrument cluster seen in Swift and Dzire. The car comes with 7.0-inch SmartPlay infotainment unit that is compatible with Android Auto and Apple CarPlay, steering mounted audio controls, voice command system, inbuilt navigation system and Bluetooth connectivity. Other features oozes the comfort and premiumness include 4.2 inch advanced instrument cluster, automatic climate control, air-cooled twin cup holders, push start/stop button, height adjustable driver’s seat, rear parking camera, split foldable 2nd and 3rd row and electrically adjustable ORVMs among others. In terms of specifications, Maruti Ertiga is available in both petrol and diesel engine options for the buyers to choose from. The 1.5L petrol mill is brand new and is capable of generating the power output of 105PS and the maximum torque of 138Nm. The oil burner comes mated to 5-speed manual transmission while is also offered with 4-speed automatic gearbox. On the other hand, its older diesel mill continuous to do its duty. The 1.3L diesel powertrain can churn the output of 89PS and yields the maximum torque of 200Nm. The motor comes mated to 5-speed manual gearbox. The vehicle delivers claimed mileage figures of 19.34kmpl for petrol MT, 18.69kmpl for petrol automatic and 25.47kmpl for diesel manual. Second generation Ertiga is now more safe with dual airbags, ABS with EBD and Brake Assist, ISOFIX child seat anchorages and reverse parking sensors as standard features. Other safety measures include Hill hold control, ESP, Engine immobilizer, seat belt reminder with buzzer, speed sensitive auto door lock and and high speed alert system. Maruti Ertiga 2018 is available in four different variants such as L, V, Z and Z+. In terms of pricing, Ertiga gets the starting price tag of Rs. 7.44 lakh and goes up to Rs. 10.90 lakh. Its base model LXI and VXI are tagged at Rs. 7.44 lakh and Rs. 8.16 lakh respectively. Ertiga ZXI AT is tagged at Rs. 9.95 lakh while its ZXI model is available at the price tag of Rs. 8.99 lakh. The automatic variant VXI AT is offered at the price range of Rs. 9.18 lakh. Talking about the diesel models, Ertiga LDI is offered at the price tag of Rs. 8.84 lakh. Its VDI and ZDI trim are available at the price tag of Rs. 9.56 lakh and 10.39 lakh respectively. Ertiga’s top of the line variant ZDI Plus is available at Rs. 10.90 lakh, ex-showroom. Maruti Ertiga still plays safe in the segment against the likes of Honda BR-V, Renault Lodgy and Mahindra Marazzo in the segment. Egress especially for the elderly would be more convenient as the floorpan is quite low and the middle door looks like a gate. Coming to the cabin space, each row can absorb adults, even 6-footers but the second row is little constricted but still usable, however. While comparing to the older Ertiga, there is not much difference in terms of space in the first and second row, but the third row does have improved shoulder, head and kneeroom. This also makes the second generation Ertiga more of a true 7-seater MPV. Even the third rowers will get some benefit from the ergonomically placed rear AC blower at the second row. The side profile looks lengthy as the car has gained 99mm of length. To many, the 15-inch alloys would appear slightly over styled. They are very similar to the Indonesian spec Ertiga. Then there is thick shoulder line that runs from the front fender all the way to the tail lights which helps the car reduce the bulk of the huge doors. The rear is equally striking as the front with three-part boomerang-styled tail lamp with LED lights appears striking. It would give you a hint of a Volvo car. The company has done a commendable job to make this car look distinctive, without compromising on aggressive and yet retaining the style of an MPV. The car retains the diesel engine while the petrol engine is brand new. But irrespective of the old and new engines, the claimed fuel efficiency has gone up in the new Ertiga due to variety of factors including 20kgs less weight and mild-hybrid technology. So, the diesel variant returns ARAI certified mileage of 25.47kmpl as opposed to 24.52kmpl earlier. The petrol powered Ertiga, on the other hand, delivers 19.34kmpl with the manual transmission and 18.69kmpl with the automatic one, up from 17.50kmpl and 17.03kmpl in the earlier manual and automatic version of Ertiga, respectively. The other nice improvement in the car is its ability to lay off road undulations. As the platform is new, the suspension is firm enough to avert bumpy ride quality. The bad patches are negotiated brilliantly keeping the passengers, especially those occupying the third row. The steering wheel is sufficiently weighted and remains predictable at most of the times. The new Maruti Ertiga is powered by new 1.5L K15 Smart Hybrid petrol engine which produces 105PS and 138Nm of peak torque which is up by 13PS and 8Nm from the previous model. The increase in power certainly reflects on the road with the car thrusts forward as soon as the driver applies pressure on the accelerator and leaves the foot off the clutch. The extra torque is also evident throughout the range which helps you drag forward loads of passengers and luggage, even going on uphill. And with the hill-hold assist function in the automatic variant, it will certainly be a boon on slanted road conditions, especially with full-load of passengers. And as usual, the powertrain feels more energetic with the 5-speed manual gearbox than the 4-speed automatic, the latter is best for relaxed driving. The automatic transmission takes slightly more time to response to the gear changes and inputs from accelerator. So in terms of overtaking manoeuvres, you have to plan for that a bit early. The diesel engine remains the same 1.3L DDiS which pumps out 89PS and max torque at 200Nm as was there in the earlier one. The engine is powered by 5-speed manual transmission. The diesel one obviously will be slightly laggy when you are starting off initially, but as the revs build up, you won’t feel much difference in the medium to high speeds. And with the extra amount of torque, you can expect a full load of passengers with luggage. The brakes are progressive and have considered bite force. And the icing on the cake is that the carmaker has further bolstered the braking mechanism by adding ABS with EBD and Brake Assist as part of standard fitment package. Other standard features include ISOFIX child seat anchorage in the second row, rear parking sensors and high speed alert system. Move up in the variant list and you will find options such as ESP, Hill Hold Assist, front seat belt height adjuster, front fog lamps and reverse parking camera. What is the price of Maruti Ertiga? On road prices of Maruti Ertiga in New Delhi starts from ₹ 8.84 Lakh for base variant LDI, while the top spec variant ZXI AT Petrol costs at ₹ 9.95 Lakh. What are the colors options available in Maruti Ertiga?